Have you registered to vote for the upcoming U.S. elections in November? Let's face it, Congress needs a bit of a shake up to get things moving again, making each everyone of your votes essential in the November midterm election. 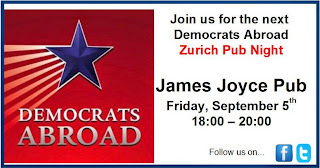 Join the Zurich Chapter of Democrats Abroad, hosted by Annamaria Fato and Myrtle Alexander, on September 5th from 6 - 8pm for an opportunity to meet fellow American expats over a drink AND to have the opportunity to register to vote for this upcoming election cycle. Don't forget to bring your U.S. drivers license or social security card along with your last U.S. voting address.